I honestly can’t remember my last doctor visit. Like many in our country, I find the prospect of interacting with the United States medical industry anxiety inducing and depressing. This month I finally signed up for a health care plan on the New York State exchange. Choosing an insurance plan on the exchange required trying to predict what kind of scary health emergency I might have and how to make sure that if misfortune strikes, I’d take the mildest financial hit. Since none of the plans seemed very good, I decided to sign up with a new, not-for-profit health insurance company. The incessant media chatter about the Affordable Care Act (ACA) demonstrates that in passing the 2009 health care reform, the political elite in this country pulled a fast one on the American people. Just listen to the public debate (chatter) emanating from the respective conservative and liberal echo chambers. On one side are the constant attempts by Republicans to use the ACA to derail and deride anything President Obama does, using it as political ammunition against most House Democrats. And then there’s the desperate attempts by the well-intentioned supporters of Obama to defend the ACA from the nasty right-wing attacks, largely ignoring the ACA’s conservative origins. This partisan bickering hides this fact: A better, more affordable, more humane health care system is possible. It’s called Medicare for All and it would lower health care costs and cover all Americans with quality health care. Nobody out, everybody in, regardless of age, income or employment status. The main feature of the ACA is the individual mandate provision that forces uninsured individuals to purchase medical coverage from a private insurance company, guaranteeing millions of new customers and billions more in profits for health care corporations. The idea of an “individual mandate” can be traced back to conservative policy wonks at the Heritage Foundation who wanted to provide an alternative to the health care reforms proposed by the Clintons in the early 1990s, which would have required all employers to provide private health care to employees, thus preserving the position of insurance companies as middlemen between patients and doctors. Eventually, the idea of the individual mandate was adopted in Massachusetts and came to be known as Romneycare,, after Gov. Mitt Romney. When Senate and House versions of what we now call “Obamacare” were introduced in fall 2009, one the world’s leading professional medical journal, The Lancet, dedicated its cover to the following quote: “The health-care reform process exposes how corporate influence renders the U.S. Government incapable of making policy on the basis of evidence and the public interest.” The health care reform which eventually passed in 2009 was largely written by Liz Fowler, vice president of policy at the nation’s largest and most profitable health insurance company, WellPoint. To be fair, the ACA does contain some progressive reforms. People with pre-existing health conditions do not need to be afraid of health insurance providers denying them coverage and routine checkups are covered and more women can access contraception and routine gynecological exams for free. The ACA also raises Medicaid eligibility from the poverty line up to 133 percent of the national level. Unfortunately, the Supreme Court gave states the right to refuse this fully-funded federal benefit, and now 25 states led by anti-social politicians are refusing to expand Medicaid coverage to some of the poorest in their state. The main problem with the ACA is that it maintains the leading role of for-profit corporations in our health system. While more people will now have health care, insurance and pharmaceutical companies will continue to exploit and obstruct what should be a personal and trusting relationship between patients and doctors. The United States’ private health insurance system is expensive and inefficient – we spend more on health care than other industrialized nations. 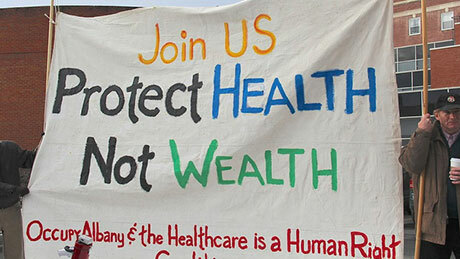 In 2011, per capita spending on health care in the United States was $8,508, 17.7 percent of GDP, meanwhile Canada, France and Britain spend much less, between 9.4 percent and 11.6 percent respectively, according to Organization for Economic Cooperation and Development Health (OECD) Data from 2011. Despite this spending, Americans go to the doctor less frequently than Canadians and the British, spend more on hospital stays and surgeries, and have more hospital visits for manageable, chronic conditions such as asthma, and diabetes. And despite these high levels of spending our outcomes aren’t much better and our life expectancy is lower than the OECD average. In an current era of stagnant wages and growing income inequality, medical debt continues to be the leading cause of bankruptcy. In 2009, 60 percent of those struggling with medical debt actually had insurance. Isn’t the point of health insurance, to prevent financial ruin resulting from needing health care? The U.S. might have the world’s best health care treatments, but if most Americans can’t afford them, what’s does it matter? In 2013, Rep. John Conyers introduced HR 676, the Expanded & Improved Medicare for All Act that would provide all individuals residing in the United States with free health care that includes all medically necessary care, such as primary care and prevention, dietary and nutritional therapies, prescription drugs, emergency care, long-term care, mental health services, dental services, and vision care, Medicare for All could be financed from existing government health care revenues, by increasing personal income taxes on the top 5 percent of income earners and by instituting a small tax on stock and bond transfers (income that is acquired without actually working). Medicare for All would cut the wasteful costs associated with for-profit health insurance. Medicare’s administrative costs are somewhere between 2 and 3 percent while in private insurance, administrative costs are as high as 30% because medical providers have to fight the insurance companies for reimbursement, creating massive bureaucratic overhead on both sides of these transactions. Add in the monopoly profits extracted by drug, insurance, and medical supply industries, and a single payer system like HR 676’s Medicare for All program would save $592 billion in 2014 while providing comprehensive coverage to all. Since we can’t count on Congress to protect the basic rights of American citizens, New York State should implement a universal single payers system on the state level. Nearly a majority of State Assembly members signed on as co-sponsors to the Gottfried bill in the previous session, and at the end of 2013, A 2078, the Single Payer NY bill was reintroduced. The Assembly needs to vote on the bill in this and make Gov. Andrew Cuomo and the state Senate confront the issue of whether or not New York state is committed to guaranteeing the right to health care for all its citizens. In fact, universal health care, Medicare for All, in addition to making economic sense, would ultimately increase our personal freedom. In addition to having the health care we need, individuals would no longer have to base career and job options on the ability of employers to provide health care. A universal health care guarantee would allow aspiring entrepreneurs to develop startup business ventures, knowing that regardless of their success, their health care needs will be met. And, if families and individuals weren’t paying into an exploitative health insurance industry, we’d either have more savings or more disposable income to spend on consumer goods, thus stimulating the economy. Imagine the relief for school districts and municipalities if they no longer had to budget for the costs of health care or bargain with public employees for benefits. Talk about unshackling Upstate. So, if the individual mandate is a Republican creation, why do today’s conservatives hate the ACA so much? I think it’s a political attempt to manipulate existing racist sentiments against the first African American president. And because the ACA is so imperfect, characterizing it (incorrectly) as socialized (aka “socialist”) medicine allows conservatives to push a myth that universal health care and other government programs are somehow bad for the American people. I’ve often joked that I’d like to marry a Canadian so I could have access to universal health care. But don’t people living in the United States have the right to health as those in every other country? Or is the U.S. exceptionally inhumane? Am I better off now that I have health insurance? Probably. But anyone who cares about having a humane society should not be satisfied until health care in our country is treated like the human right, rather than a pay-or-die commodity. 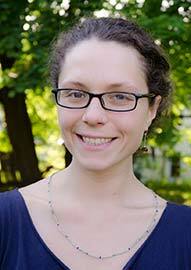 Ursula Rozum is a guest columnist who writes montly for The Post-Standard and syracuse.com. She ran for Congress on the Green party line in 2012.